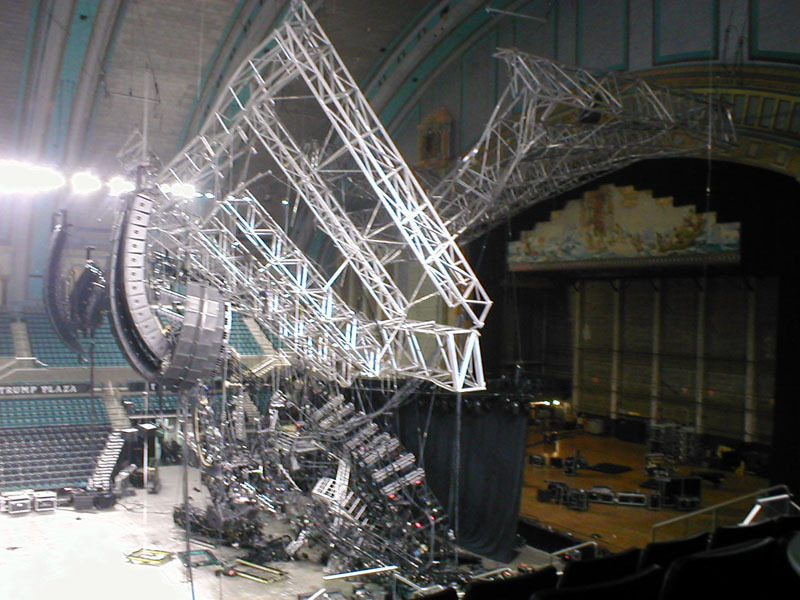 In 2003 in Atlantic City, NJ at the Boardwalk Hall, the Justin Timberlake/Christina Aguilera show that was close to soundcheck underwent a major catastrophic failure of the venue’s supertruss. 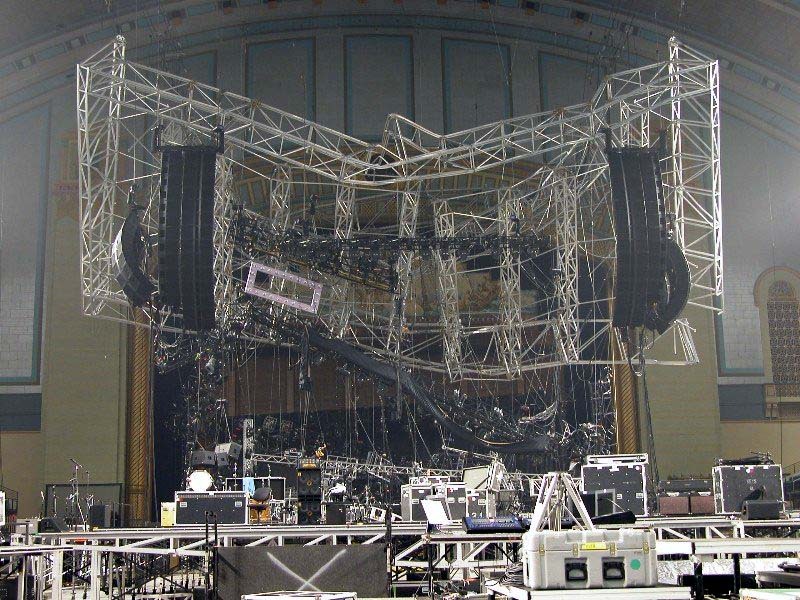 The show’s systems, which were rigged to that truss, rode it down to the ground and smashed nearly every bit of the show’s gear. A few people were hurt, but only minor injuries were sustained (from what I understand), but the show’s gear was a major failure. Here’s some shots of the disaster. 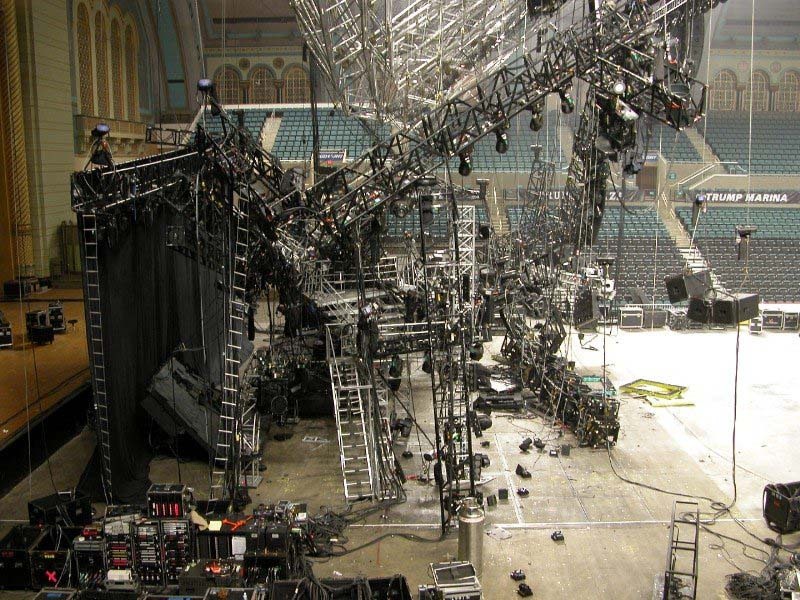 Next time you’re at a show, remember that the people who’ve rigged this stuff above you are professionals, and be glad that they are. I run upon Your blog few days ago as I was searching for some info and details on truss collapse on Aguilera show..
What’s interesting, I couldn’t find detailed information anywhere. I guess inspection is still doing their job or something..? Anyhow….why am I interseted in this particular case…..I have heard many stories how and why this happend, but I managed to forget the only one that might have been the most realistic that told Mr. Bakker of Rhino Rigs whose rigging course I have attended this year so I could continue to work proffesionaly in entertainment business. So…..if You have any more details, could You please post them. I will track Your blog awaiting any possible info You might give me. 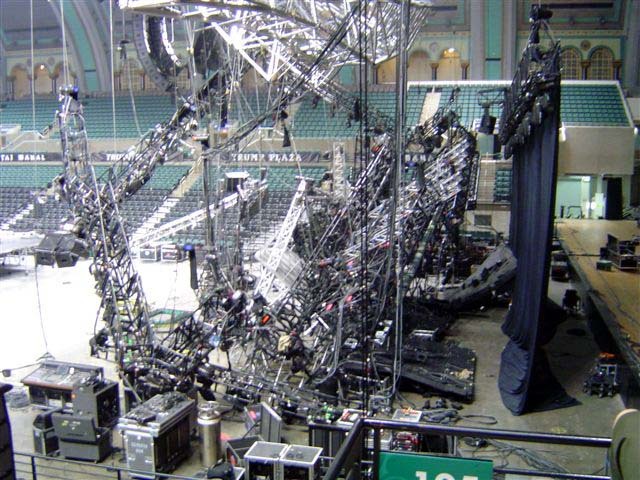 As I understood it, the failure was eventually traced to a turnbuckle that failed in the rigging for the supergrid. I do NOT have a reference for this (though I may be able to find one) and am quite happy to be corrected. My understanding is that the piece in question was not correctly rated for the load being lifted on that occasion, and it’s failure caused a “follow-on” failure of other rigging and grid pieces resulting in the pictures shown above. I actually saw those pictures the morning after because a “friend of someone who was there” was doing a gig in one of our venues and got the pictures via a personal email that morning. Either more than one point was wrongly rated or someone didn’t take horizontal forces into consideration.